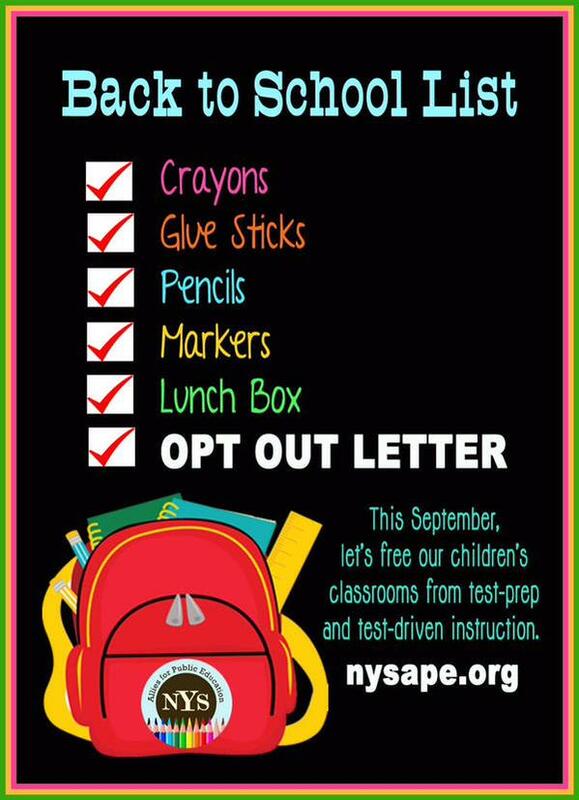 Here is my family's 2015-16 Refusal/Opt Out letter. Why are we sending in our letter at the beginning of the school year? 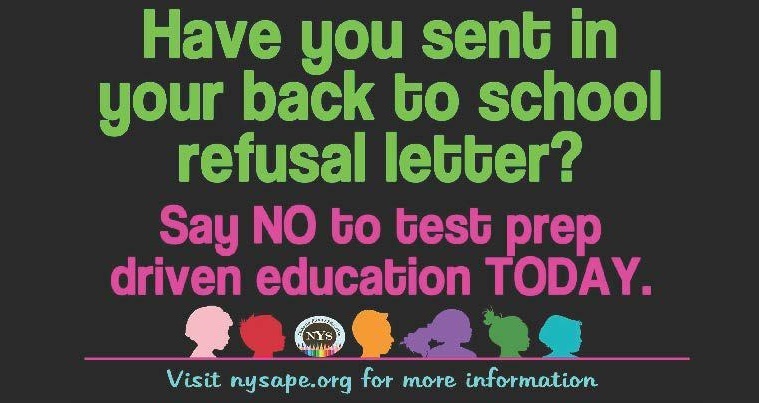 The massive boycott in the spring of 2015 that resulted in about 220,000 students refusing the NYS Assessments had many districts with a high percentage of opt outs. 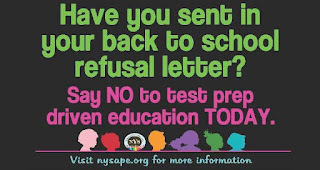 Parents in the opt out movement have been fighting the need to "test-prep", which in the long-run is more harmful then the assessments themselves. If enough parents in a school, grade-level or classroom were to present their Refusal Letters in September, would this reduce or eliminate the need to prepare a class, grade-level or school for the assessments? Would a significant statement by families alleviate the pressure on schools, administrators, and teachers? Could teachers bring more creativity, creative thinking and imagination into the classroom? 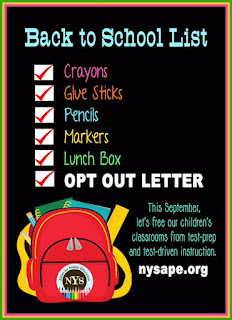 We based our 2015-16 letter on the letter created by the NYSAPE Opt Out committee. The actual letter we sent to our children's schools eliminated some of the check off lines that do not apply to our children's grade levels. You can copy and paste the words below or use this link to view/copy or edit your own letter. We hope that other parents will join our efforts here at __________ so we can reduce the need to prepare for the state assessments and allow our teachers to focus on creativity and critical thinking. We are aware that NYS Education Commissioner Mary Ellen Elia will direct you to talk us out of this decision in an effort to push forward the corporate takeover of public education. We decline any such meeting or phone call. Do not contact us for that reason. Commissioner Elia and Chancellor Tisch have attempted to paint families who boycott high-stakes testing as uninformed, when we completely understand the harm that such assessments have done to our children’s public education. To protect yourself and our district, keep this letter as proof to Commissioner Elia that we have declined. Instead, we invite you and other district officials to attend an educational seminar detailing the expert research and reasons that have led parents to refuse participation in this harmful testing program.